Cost: This set costs around £15 but there are all manner of theme packs and refill kits ranging from between £5 and £20. 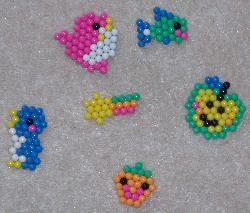 1200 little balls (in a selection of colours) which look like they're made of plastic but that go sticky in water. Snap-shut case divided into compartments for the different colours of bead. Pattern holder with a see-through, dimpled cover for arranging the beads on. Small bottle with a spray nozzle. A couple of sticky pads to turn designs into badges. How does it work? : A pattern sheet is inserted into the holder so that the pictured beads line up with the dimples. 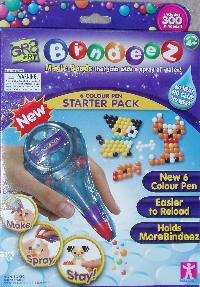 The pen is then used to pick the beads up one at a time and drop them into place where the pattern shows. Beads are picked up by stabbing at them and dropped with a push of a button. Once the design is complete, it has to be sprayed with water and then left to dry for an hour before being turned over, sprayed and left to dry again. The water dissolves the surface of the beads so that they fuse together. 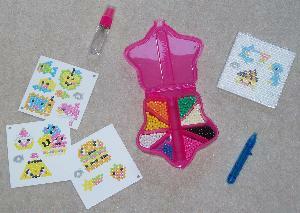 Object: To create bead charms and pictures. 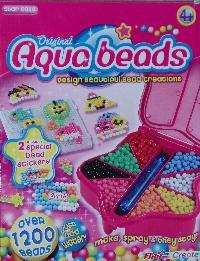 Age: 4+ officially but Aqua beads are even more fiddly than Hama beads, so you might want to hold off for a bit. Comments: Sproglette's supply of art materials is beginning to take over the kitchen. She has paint, chalk, pens, felt, beads, lollipop sticks, pipe cleaners, stickers and goodness knows what else. It's all shoved up the corner of the room in a precarious heap next to the ever-growing pile of creative designs she's producing. I really don't have a clue what to do with it all. This being the case, I was less than thrilled when she decided to spend some Christmas money on yet another box full of highly-spillable craft items. but they're fairly fragile and water soluble. Getting them wet, handling them with wet hands or leaving them in a trouser pocket on wash day is liable to end in misfortune. This could be construed as a feature in miniature bead replicas of gremlins or the Wicked Witch of the West but generally isn't too practical. Perhaps the biggest issue with Aqua beads is that once a design has been sprayed, it's a couple of hours before the board is dry enough to be used again. A prolific artist will require more than one board. Conclusion: OK but not entirely convincing. No glue or heat required. Patterns can be copied directly. Creations don't take up much space. 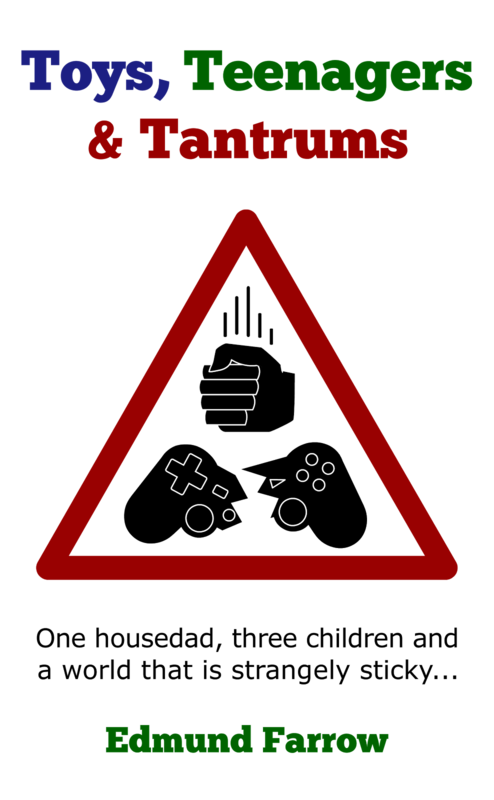 Requires slightly too much patience and concentration. The included designs are somewhat odd. Rating: 3/5 on a good day but I'm living in fear of some kind of freak accident involving an Aqua bead penguin, a glass of water and the lounge carpet. That could be a real 1/5 experience.